Life with Liv: Making tulle pom-poms. 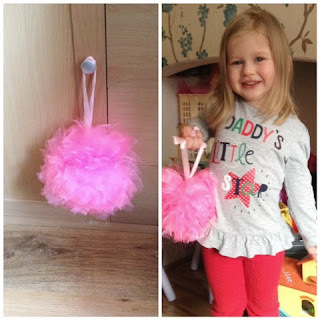 I have seen a few pictures lately of lovely big tulle Pom-poms hanging from bedroom ceilings so Liv and I had a quick go at making one of our own last week. Liv helped wrapped the tulle around the book 15 times, then we tied the tulle on one side of the book with some ribbon leaving enough loose to allow us to take the tulle off the book and tie it all around the middle using the ribbon already attached. Next I tied another piece of ribbon around the centre to use as a handle or for hanging. Then I cut both ends of the tulle before we fluffed out the Pom-Pom, the more you fluff, the better it looks! Liv has had great fun dancing around with this one and the tulle has frayed quite a lot on the edges and moved giving it an uneven look but the bigger ones we make will be hung up so that shouldn't be an issue. 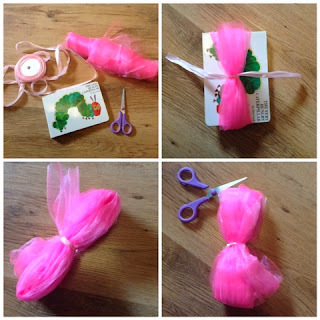 Cheap, easy and fun, why don't you give it a go too?